I’ve always loved the idea of linking the old with the new. Whether it’s filling your home with antiques or creating a wall collage of old black and white ancestral photos, it was always important to acknowledge the past. One of the easiest ways to bridge the two worlds is to inject a bit of history and a punch of color by incorporating an old art form from West Bengal known as “kantha” throws or quilts. The word kantha is derived from the Sanskrit word “kontha” which means rags. 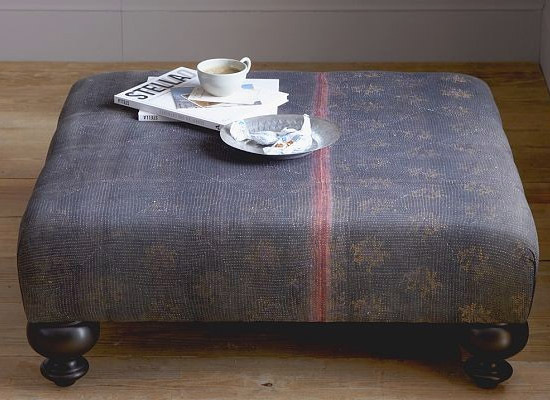 Today, the word kantha refers to the simple running stitch used to create each of these throws. In Bengal, where kantha throws originated from, women created these throws out of necessity to help protect from the cool winter evenings. These heirlooms were created by applying the kantha running stitch to their vintage cotton saris. The women would lay up to seven vintage saris taking care to choose their best ones for the top and bottom layers. The running stitch creates both a quilted effect to the kantha throws and would also help keep the saris layers together. The result is a beautiful piece of tapestry, each with a unique story to tell. Kantha are wonderful conversation pieces which can be easily incorporated into any décor. For a well-traveled look, drape the colorful kantha effortlessly on a couch, or have it hang neatly behind a couch for some structure. Adding coordinating color elements to accessorize your coffee table will help bring out the beautiful vintage sari colors from the kantha. In recent years, kantha has entered the general market in various other forms, ranging from personal accessories such as clutches and bags to clothing and furniture. 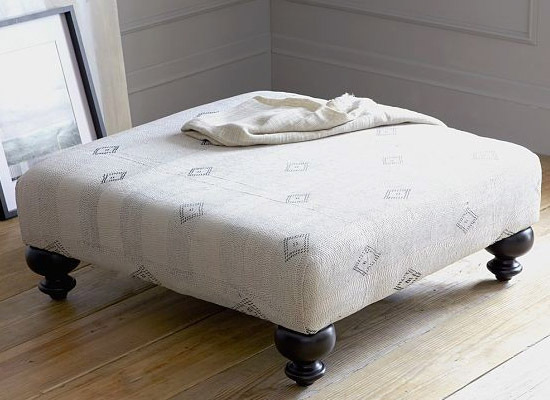 Major retailers like West Elm and Pottery Barn have also embraced the kantha story and have created furniture pieces using the vintage kantha throws. 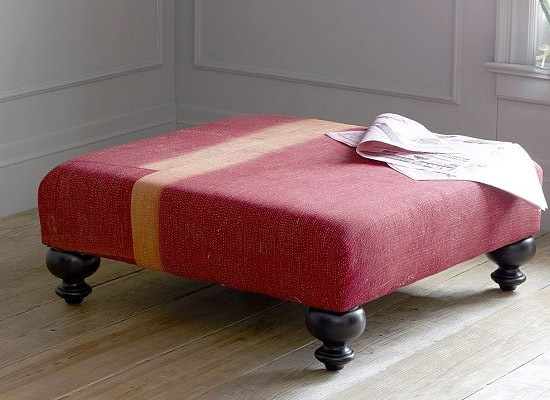 Here are a few examples of West Elm’s Essex Ottoman. (Although at last check these particular ones are no longer available). Each vintage kantha tells a beautiful story of life-long preservation, and are typically passed down to future generations. These kanthas breathe new life into something old and remind us that vintage art forms do have a place in the modern world. For hand-selected vintage one-of-a-kind kantha quilts, stop by Harabu House. Each of their kanthas are personally selected by Shilpa Iyer, founder of Harabu House. Her kanthas have been featured in Apartment Therapy and Sunset Magazine, while several other global finds from her shop have been featured in the New York Times, New York Magazine, Bon Appetit, Foodnetwork Magazine, House Beautiful and several other publications. In December 2010, Shilpa Iyer founded the distinctive online home and lifestyle boutique, Harabu House. With a lifelong love of décor coupled with her multicultural upbringing, Shilpa was inspired to make modern, yet global-inspired design accessible for everyday living. Shilpa, who is Tamilian, was born in Chandigarh, India and raised in Singapore. She attended local and international schools where she was exposed to and influenced by both Eastern and Western traditions. This blend of cultures allowed her to develop a great appreciation for artisanal craftsmanship from around the world. Today, Harabu House customers will find a comprehensive selection of beautiful, stylish products – each hand-selected by Shilpa. The diverse range of home décor andlifestyle accessories reflects a modern, fresh style – each perfect for everyday living or as a gift. Harabu House also strives to offer sustainable products that provide economic, social and environmental benefits to those artisans who create them. The company is based in Red Bank, New Jersey where Shilpa works and resides with her husband and son.